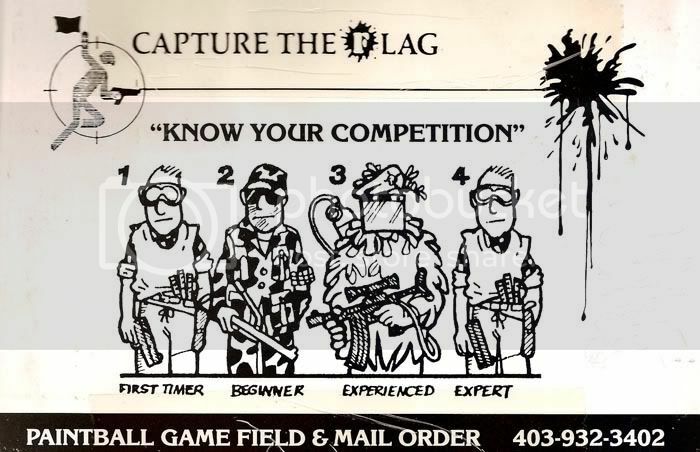 Longtime MCB'ers and other internet-savvy paintballers have undoubtedly run across a little single-panel comic labelled "Combat Manual", showing the four stages of a player's evolution. From first timer, to beginner, to experienced, to expert. The joke being that the expert looks just like the beginner. What many of you may not know is just how old that comic is. 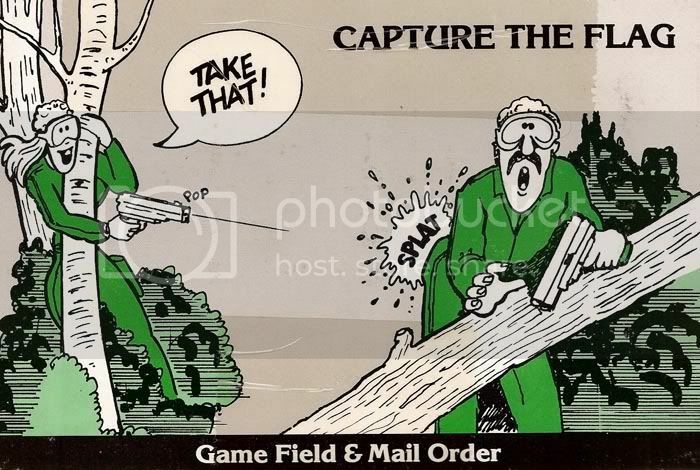 To the best of my knowledge, it was originally drawn by Fred Moulton, of "Sgt. Splatter" paintball comics fame. And according to Durty Dan, Fred drew it around 1983. For those who don't know, the sport itself only dates to mid 1981. I know I saw it online- and saved a copy- back in the 90s, in the old WARPIG Tech Talk days. I suspect the reason it looks like a bad photocopy was that somebody, likely Fred himself, scanned it at low resolution, saved it as a small GIF file and probably uploaded it to a newsgroup. 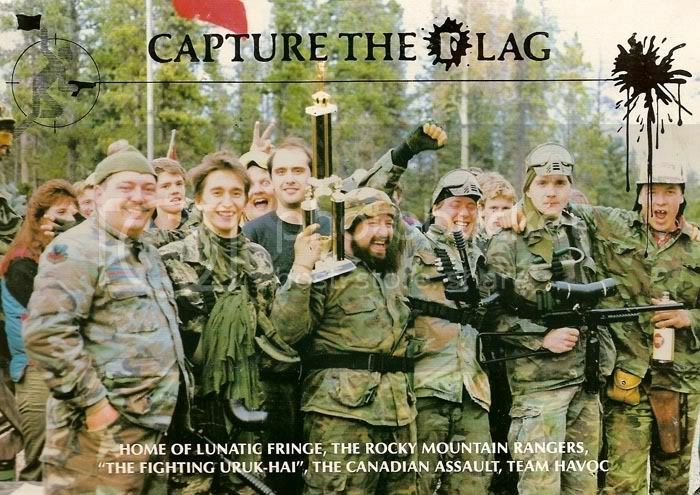 Most likely rec.sport.paintball or something like that. Since I don't think it was ever published anywhere, nobody's been able to re-scan it to get a better image. That's all a little guesswork, but probably mostly correct. The reason I bring this up is I just happened across a copy I re-drew a year or two ago. I'd blown it up, cleaned it up, redrawn what needed to be redrawn, and saved it. I'd intended to make a TWB version of it with one of my characters- and with more modern safety gear - but I just haven't had the time. I figured I'd post the new version for y'all to check out- same size and everything. The only real error I made was I assumed the first timer and expert were duplicates- in these days of Photoshop cut-and-paste, a perfectly natural assumption. But the original cartoon predates Photoshop by a number of years, and had I looked closer, I'd have noted that Fred just drew a duplicate- very close, but not exact. One of these days I may redraw the redrawn drawing. Looking pretty good! Definitely saved. Fred didn't draw that one. It came out a little while after he started his cartoon, probably 89-90. Last edited by HyperU2; 11-16-2014 at 09:17 AM. Fred didn't draw that one. He can't remember who drew it either. - On this page Durty Dan lists a version he redrew as well, tagging it as having been 'redone from 1983 original'. The part where Dan said Fred did it I recalled from a board post years ago- which board and exactly when, I can't remember. It's possible he was guessing/assuming as well. If Fred didn't do it, I wonder who did? Last edited by HyperU2; 11-16-2014 at 06:00 PM. I seem to remember seeing it in an early APG but can't state that for certain. I have always loved that comic. We should have a thread of redraws....maybe even a contest.